Repellants generally contain the urine scent of a predator such as a coyote, or the smell of mothballs to keep the squirrels at bay. While squirrels dislike these smells, using them as a repellant simply is not very effective. These furry critters are more intelligent than we give them credit for, and are very adaptable to changing environments. Once the initial scare of the repellant wears off, squirrels will soon realize there is no actual threat, and will continue to nest and wreak havoc on your home. 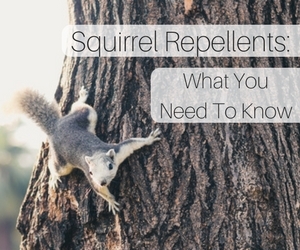 You may notice an initial decrease in squirrel activity after using repellent, but the effects are only temporary. Once they figure out that there is no actual threat, they will return – often in larger numbers than before. Some types of squirrel repellents are known to contain ingredients that are toxic to squirrels as well. If you want to rid your property of a squirrel infestation the right way, the best thing you can do is call Critter Control® of Dallas. Without putting you, your family, your home, or the squirrels in danger, Critter Control® of Dallas will remove the nuisance critters from your property efficiently, and can implement preventative measures to ensure they do not return. Contact us today at 817-222-1101 with any questions, or to schedule a complimentary consultation.